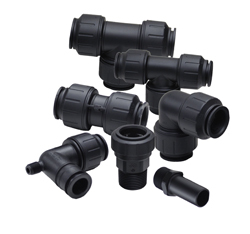 New UV Resistant black fittings have been specifically designed for Water Filtration/Softener Installs; however, they are also suitable for applications in Plumbing Repair and Remodel, Marine and R.V. Speedfit Black Fittings are available in 3/4” CTS and 1” CTS Sizes in Elbow, Tee, Union, Male and Stem Elbow configurations. The Speedfit® new addition is lead free and easy to install without the need for any tools. Speedfit’s unique patented Lock & Twist® technology featuring a collet with stainless steel gripping teeth and an EPDM O-ring ensures leak free connections. Fittings are IAPMO approved, NSF Certified and can be used with copper CPVC or PEX pipe. The new black fittings are immediately available for sale.